Exercise bikes are one of the most common machines that you will see in any home gym and rightfully so since they’ve been around the longest and can be the most compact and easy-to-use addition to a home workout. On the search for the right bike for my home gym, I did a lot of research online and in the stores because I am quite particular about what I spend my money on. After a lot of searching and questioning, I am pretty impressed with the Schwinn 220 Recumbent Exercise Bike because it seems to have it all as far as recumbent bikes go. Hopefully you’ll find all of my research helpful in your search for the best exercise bike. Now I am not an expert on exercise bikes but I do know that with all of the looking around that I did that the Schwinn 220 Recumbent Exercise Bike meets and exceeds the expectations for everything that you should be looking for when you purchase one. The Schwinn 220 Recumbent Exercise Bike has a 13.2 pound flywheel and offers 16 different levels of resistance. That’s 16 different choices for you to pick from when you decide to mimic riding up hills. Do you want to take a light and simple cruise through rolling hills or are you daring enough to attempt to ride up Mt. Kilimanjaro and seriously feel the burn? I prefer starting at the bottom where it feels like flat land and slowly working my way up to somewhere in the middle. It really is a great workout! If it isn’t going to fit and be comfortable when I use it, I’m not going to use it or buy it. What’s the point in purchasing an exercise bike if it makes certain body parts hurt when that’s not even the body part being used in the workout? Long gone are the days of exercise bikes with an actual bike seat that are literally a pain in the rear. The Schwinn 220 Recumbent Exercise Bike has an extremely comfortable seat. It’s more like sitting in a chair than on a bike! Everything is adjustable with the seat so you can keep it at the height that you need and the backrest is heaven sent. I just wish they made seats like this for my mountain bike. 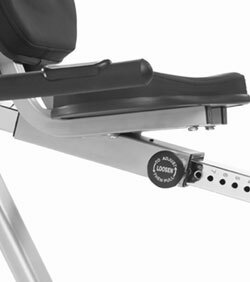 The console is also adjustable so you will be comfortable and be able to reach it anytime you need to while using the Schwinn 220 Recumbent Exercise Bike. The Schwinn 220 Recumbent Exercise Bike comes with 12 pre-loaded workout programs that are ready to go when you are. There is a custom workout option along with a fitness test that will let you know exactly where you are at that moment. 6 courses that will change the resistance as you go, providing you with a more rounded workout that changes constantly. Every piece of electronic exercise equipment that you purchase should have some sort of built in heart monitor. On the Schwinn 220 Recumbent Exercise Bike, the heart monitor is conveniently located in the handles that are by your sides. As you grab hold of the handles, the machine picks up your heartbeat and displays it to you so you know exactly where you are at all times. Heart rate monitors let you know when you have achieved your target heart rate for burning calories that result in losing the weight that you want. It will also let you know if your heart rate climbs too high which can result in cardiac problems that you just don’t want! The heart monitor is a great feature on the Schwinn 220 Recumbent Exercise Bike. You know, it really is the little things that can sometimes make a big difference! The features lists on the Schwinn 220 Recumbent Exercise Bike are amazing. It has the Eddy Current Brake system which is great if you need to stop the bike NOW. The extra features on the seat adjustments are great! You can not only take it up and down, but you can also slide it forward or backward. The pedals are ergonomically designed for comfort which means you can last longer in your workout. It has a magazine rack so you can have your favourite book or magazine handy in case you become bored. There are wheels on the Schwinn 220 Recumbent Exercise Bike that make moving it around a breeze! It switches from miles to kilometres at the touch of a button. This exercise bike is loaded! Yes, the Schwinn 220 Recumbent Exercise Bike has a 5 year warranty on the frame, 1 year on parts and electronics, 3 months on wear parts and labor. The Schwinn 220 Recumbent Exercise Bike has received a lot of great reviews and feedback. Currently it is ranked 4.5 stars out of 5 on Amazon.com’s website. I didn’t come across too many complaints about the Schwinn 220 Recumbent Exercise Bike. When reading all of the reviews that I have seen, the only thing that really jumped out at me is that the pedals are smaller and some people just don’t like that. Where Can You Read More Reviews for the Schwinn 220 Recumbent Exercise Bike? Where Can You Buy the Schwinn 220 Recumbent Exercise Bike? Right now the Schwinn 220 Recumbent Exercise Bike is available on Amazon’s website with a massive saving with free super saver shipping.